Claude Monet, the leading member of the French Impressionist school, was born in Paris on November 14, 1840, and died at his country home at Giverny in 1926. Though he exhibited in the Salon of 1865, and had the gifts to become a commercially successful artist, Monet preferred painting en plein air, and suffered a good deal of financial hardship until late middle age. His father owned a shipping firm and moved the family to Le Havre when Claude was five, intending his son to follow him in the business. Claude preferred drawing, however, and was introduced to landscape painting by Eugene Boudin, a local artist. Monet moved to Paris in 1859, and enrolled in the Academie Suisse, where he met Camille Pissarro. 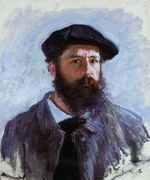 After a short military service in Algiers, Monet returned to Paris, where he mixed with other artists who were to join the Impressionist movement: Auguste Renoir, Alfred Sisley, and Frederic Bazille. The Salon of 1865 selected two marine landscapes of his, and the following year a landscape and a portrait of his lover and future wife, Camille Doncieux. Money was tight, especially around the birth of their son, Jean, in 1867, but Monet eventually found a patron in Louis-Joachim Guadibert, which allowed him to work and marry Camille in June 1870. During the Franco-Prussian War, the family fled to London, where Monet found his first dealer in Paul Durand-Ruel. On his return to France, Monet settled in Argenteuil, an industrial town west of Paris, where he was visited by fellow artists who formed the Société Anonyme des Artistes Peintres, Sculpteurs, Graveurs. It was their exhibition of April 1874 that proved revolutionary, where Monet's 'Impression: Sunrise', depicting Le Havre's harbor in morning fog, suggested the name Impressionists to critics who were used to seeing more highly-finished work. Camille became ill in giving birth to their second son, and eventually died. A greatly-distressed family went to live with Ernest and Alice Hoschede and their six children, where Monet gradually became attached to Alice. In 1833 the extended family moved to Giverny, where, after Ernest's death, the couple married in 1892. From Giverny come the famous waterlily studies, but throughout his life Monet made extended studies of objects in changing seasons and lighting conditions: haystacks, Rouen Cathedral, the Thames in London, the local countryside. Monet became more popular as the public in nineteenth-century France turned into the middle classes, who lacked the money, classical education and/or space for the sumptuous depiction previously patronized by church and state. Prepared canvases — stretched, primed and given white or tinted grounds — became commercially available in popular sizes. Most Impressionists used them, only occasionally ordering something more made to measure. Canvases came in flax, cotton or hemp. Often a coarse weave was preferred, the texture showing the short brush strokes to advantage. Rather than exploit the resinous depths of the oil medium, Impressionists painters tended to drain off excess oil from the tube and aim for a flatter, dryer and more pastel-like effect. That emphasis on flatter surfaces was in time to collapse the illusion of depth and, through Cézanne and then the cubists, lead to 'painting as the application of paint', i.e. to twentieth-century abstract art. Commercial available oil paints in lead tubes allowed artists to work out of doors, but the larger Impressionist pieces were generally finished in the studio, or completely painted there from outdoor sketches. Unlike the traditional approach, which was planned carefully, and completed section by section, allowing previous work to dry before continuing, Impressionists generally preferred to 'work the whole canvas at once'. They rapidly built a patchwork of strokes by intuition and eye, applying broad strokes to larger objects in the foreground and smaller ones for distant objects. Each stroke was therefore a rapid jotting down of a visual impression, and represented the 'local colour' wherever possible, i.e. colour as it actually appears to the eye, unmediated by previously applied, surrounding colour or demands of a harmoniously-pleasing result. If a quick study, especially if painted out of doors, the application would be wet into wet, i.e. the colour would be partially mixed on the canvas, a method giving vigour and freshness but also muddy botches at times (as in 'La Grenouillère' below). More considered pieces ('Saint-Lazare') would be worked in layers, with previous work left to show through. Sometimes patches of the original ground itself were left, when the effect of glowing sunlight could be achieved with a loosely-painted blue sky and scumble of white clouds over a creamy ground. Layering also allowed compositional details to be added, the colour balance to be modified, and the sense of distance varied by juxtaposing warm colours against cool — all against the stated objectives of Impressionism but giving a more pleasing work. Monet helped painting find new approaches. He used commercially-prepared paint in bold, short brushstrokes. He replaced idealized classical landscapes with direct painting of contemporary settings, even industrial scenes, making them vivid, atmospheric and shot through with the effects of changing light. Painting became a continuous improvisation, the painter's direct response to what he saw, and in time the nature of that response — what it meant to be a painter — became the subject of prolonged and abstruse thought. Theory entered art, becoming more important than manual skill in twentieth-century work. The painting is one of two sketches preparatory to a more extended treatment, now lost. The sketches are either crude and hurried, or a vigorous, atmospheric and brilliantly effective rendition of the visual scene — depending on historical viewpoint: Monet called them 'bad sketches'. There are clearly elements that have gone wrong: the muddy treatment of the foliage centre right, and mechanical dabs of white on the lake surface, for example. Or the pale blue oars laid over the boats in the lower left, and the bathing hut in the left middle distance that have been added with pale blue 'paint remaining' or as an attempt to tie in the composition: they are certainly not as observed. Monet's choice of palette may reflect what he could lay his hands on more than deliberate choice: he had hardly the money for food at this time. The National Gallery's analysis indicates lead white, chrome yellow, lemon yellow, vermilion, cobalt violet, Prussian blue, cobalt blue, emerald green, viridian green and chrome green. The sketch was probably painted on site, but there are later additions: some of the foliage in the top right, the white around the bathing figures probably, and small canoe on the extreme right, which was added to prevent the water below the duckboard appearing a mirror image of the water above. The composition is unusual for the time but not haphazard. A mosaic of dark and light is echoed across the horizontal divide of the duckboard. The blue water in the bottom right is echoed by the light green foliage in the top left. The greens are tied into the blue by painting parts of the canoes in viridian green, a rather obvious device betrayed by the overworked foliage in the top right. The painting is one of a series that Monet painted when living nearby in the rue d'Edimbough. They were painted rapidly, seven being finished in time for the third Impressionist exhibition of April 1877. The artist is looking north and seeing buildings outside the station bathed in warm afternoon sunshine. Most versions are fairly similar, but some move the vantage point further towards the engine. The colour scheme is a split complementary one of red-orange-yellow set against blue. Richer, warmer reds and oranges are also played against the cooler blues and blue-whites. Particularly telling are the small dabs of pinkish orange in the left foreground, around the steam engine and making the balconies of buildings in the extreme right distance. Monet seems to have used lead white, chrome yellow, vermilion, red alizarin lake, cobalt blue, probably ultramarine blue, cobalt violet and possibly viridian green as his palette. A little black was probably added to make the dull grey of the steam engine (the tone differs between versions). The paint has been applied in broken layers, wet over dry, allowing earlier colours to show through. 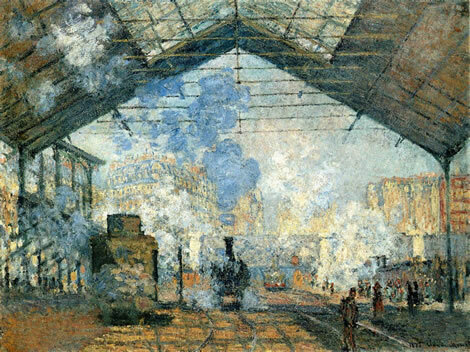 Atmospheric effects are Monet's concern, not paint textures or colour juxtapositions in the manner of Jackson Pollock and other abstract painters. The paint is crusty and the texture quite various, but neither is exploited for its own sake. The composition emphasizes the rectilinear pattern, with canopy struts above echoed in the rails and shadows below. The triangular roof reappears in Baron Haussmann apartments seen centre left and again in the (probably exaggerated) perspective of receding railway lines. A rather ambivalent sense of distance is obtained by having the white steam in the middle distance lighter in tone than either the shadowed foreground or the buildings catching the sun in the distant right of the painting. 1. Claude Monet biography. Biography.Com. Attractive presentation through paintings and interviews. 2. Claude Oscar Monet Biography. Claude Monet Gallery. Detailed, with prices and complete works, which show how very varied is their quality. 3. 'Google Art Project'. Claude Monet. A generous 144 canvases may be examined closely, from all periods except the very early. 4. 'The Saint Lazare Station'. 1877. Museée D'Orsay, Paris. Google Art Project. 5. Bathers at La Grenouillère 186. Claude-Oscar Monet. National Gallery. 6. Wilson, M., Wyld, M., Roy, A. 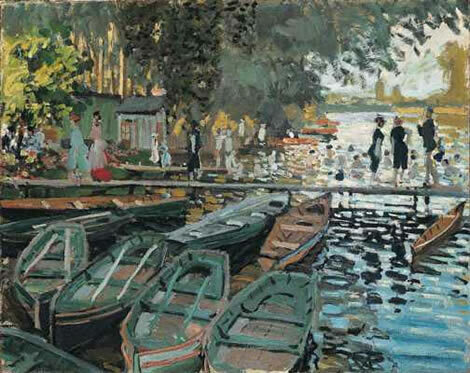 'Monet's "Bathers at La Grenouillère"'. National Gallery Technical Bulletin Vol 5, pp 14–25. Background and technical matters sympathetically explained. 7. 'Techniques of the Impressionists' by Anthea Callen. Tiger Books International. 1993. pp 58-67 and 84-7.